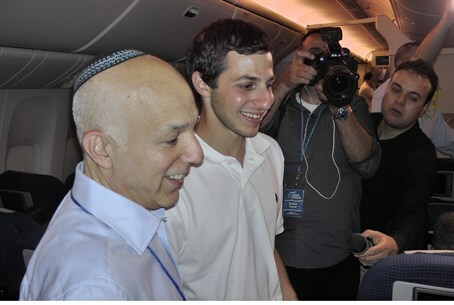 Arutz Sheva filmed Gilad Shalit praising the new immigrants as they arrived on a “Nefesh B’Nefesh” plane in Israel this morning. Arutz Sheva filmed Gilad Shalit praising the new immigrants who arrived in Israel this morning on a record-breaking “Nefesh B’Nefesh" flight. The new immigrants were extremely moved by the presence of the recently freed Israeli solider, who expressed his gratitude on behalf of the Israeli people.